Bonthrone Security Services provide a full range of access control systems for both domestic and commercial premises. Access control can provide a number of benefits to your domestic or business premises, from keeping track of staff movements and generating time sheets and attendance records, to building management and hotel door control, issuing custom proximity cards or fobs. Our high-end access control systems can provide a number of benefits. Bonthrone Security Services can provide automation and installation of new and existing gates and barriers from domestic through to large-scale commercial sites. Whether you are just protecting your driveway or controlling traffic on a busy site, we will have a solution to suit your requirements. We also design and install intercom systems from single to multiple occupancy buildings with video or audio solutions to suit each site. Wireless GSM (Sim Card) and networked IP solutions are also available to allow communication and control of equipment remotely. Bonthrone Security Services provide access solutions, for business premises. These include multi-user, biometrics, code entry, GSM based, Video/Audio entry and Automation systems. We are specialists in surface mounted “ram type” and underground, 100% rated, electronic gate installations, from light to heavy grade. We can also supply and install metal/groundworks. Bonthrone Security Services provide a full range of access control services, from a single one way audio/video system to multiple user systems, with remote access or multi-user for a block of multiple flats/offices. Our security specialist will always make their recommendations for an optimum solution for your individual needs, matching your budget with an appropriate system. BSS install and maintain Door entry systems, Multiple occupancy door entry systems, Video door entry systems, Automatic gates, Underground automatic gates, Automatic barriers, Rising bollards, Automatic doors, GSM door entry and Biometric access systems. We know just how important your business is to you, and our job is to help you protect it. BSS will ensure this is done to the highest standard providing you with real peace-of-mind. All installation work will be carried out with attention to detail and with respect for your business. Can’t cable? No problem. We can provide GSM solutions, which operate over mobile telephone networks. This means that you can now have comprehensive access control, even in remote areas. We provide a variety of electronic door locks, for low or high-security applications. We can provide biometric access control, using fingerprint recognition. These systems can incorporate full data logging and reporting, providing you with a clear picture of facility use for individual users, from 2 to 200+ users. We understand how important your business is to you and believe in spending that little bit of extra time during installation, to save time in the future. This ensures that when we hand your system over to you, it will be trouble and error free. You should only ever see us when we return for periodic maintenance visits. All our equipment comes with a minimum 1-year warranty, which can be extended to 5 years on many products, for extra peace-of-mind. If a fault should occur, we won’t leave you without protection, always ensuring that a temporary solution is in place before removing equipment for warranty repairs. When we visit your business for the initial site survey, we look at all security aspects, from what type of doors and windows your property has, to whether you have under floor or attic space. We look carefully to see how we can route cabling, to minimise visual impact and, where necessary, can use wireless systems. We ensure that when our engineer arrives on site, they will be able to start work straight away having been briefed by our surveyor. We will communicate as a company, ensuring that we provide your system as effectively and with as little inconvenience as possible. BSS offers full comprehensive or basic, annual preventive maintenance packages on all systems. If the system was not initially installed by us, we will thoroughly inspect the system during a previously arranged take over maintenance visit to ensure it is brought up to an acceptable standard. We provide a full, 24-hour service, 365 Days per year, with no fuss attendance, as and when required. We can arrange Keyholder / Emergency Service response active 24/7, to safeguard you and your property(s) through various signalling methods. We believe in working to suit the customers’ needs. We will always contact you, prior to visiting, to arrange a mutually convenient time and date for any required maintenance work. We understand the wear-and-tear your access systems can go through, with day-to-day use. BSS preventive maintenance programmes ensures this does not adversely affect your systems – ensuring they continue to operate smoothly and effectively, as time passes. With our commercial access systems range of maintenance programs, we attend site for two pre-scheduled visits per year, to check all system components for wear-and-tear, correct operation. We’ll tighten up all connections and ensure system integrity is kept to a high standard. We know that access systems have to withstand abuse every single day and we design them with this in mind. All systems are installed to BSS standards which ensure maximum utilisation of your system’s functionality tailoring your systems to your commercial premises, big or small. 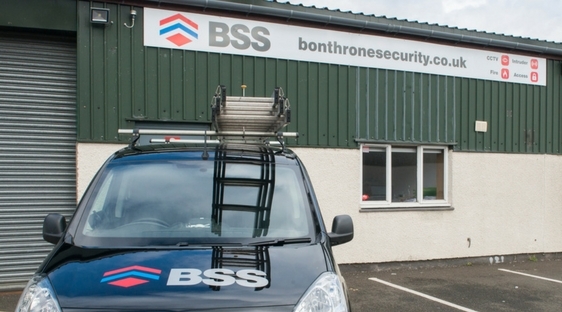 Bonthrone Security Services provide access solutions, for domestic premises. These include multi-user, biometrics, code entry, GSM based, Video/Audio entry and Automation systems. We are specialists in surface mounted “ram type” and underground, 100% rated, electronic gate installations, from light to heavy grade. We can also supply and install metal / groundworks. “We recently replaced our old CCTV system with a new digital system from Bonthrone Security Services. From the initial meeting to discuss our requirements through to the installation, Ian and his team were very knowledgeable and professional. They helped us design a system to meet our needs and our budget. I would not hesitate to recommend BSS, in fact I have already done so several times. “We have used Bonthrone Security Systems for our Fife based Care Home group for a few years now, and we are very happy with the service they provide. They can advise on superior equipment, that is relevant to our needs, or where we request, they will repair existing equipment. I would have no problem in recommending them.